Best known as the birthplace of Antonio Gaudi, Spain’s most famous architect, the city of Reus is located 17 kilometres inland of the city of Tarragona. Situated in an area well known for the production of wine, Reus had an important textiles industry during the 18th century, though its history goes back to the 13th century. Most visitors know Reus solely through the name of its airport which is the primary arrival point for holidaymakers visiting the Costa Dorada seaside resorts of Salou, Cambrils and La Pineda, the airport is some three kilometres outside the city itself. Not exactly known as a place to visit, as it overshadowed by its older neighbour, Tarragona, worth a look is the San Pedro church and the El Museo Municipal Prim Rull. Just back from the Costa Dorada coastline Reus benefits from a typical temperate Mediterranean climate with Reus weather being much the same as the coastal resort with warm dry summers and mildish winters. Reus can be reached by road by way of the T-11 from Tarragona and also from the A-7 motorway. Reus Map. Three contrasting towns in the province of Almeria in south-eastern Spain, Roquetas de Mar, Carboneras and Sorbas will have varying attractions for visitors to the area. The former fishing town of Roquetas de Mar has now become one of the largest resorts in the Almeria region attracting a mostly Spanish group of tourists though becoming more popular with International holidaymakers, its history goes back to the Roman occupation of the Iberian Peninsular, though its historic castle and fortifications date from the Moorish period. Roquetas de Mar boasts some wonderful sandy beaches, some fine seafood restaurants and a decent choice of facilities. A smaller and less well known coastal resort, Carboneras is situated at the northern end of the Cabo de Gata Natural Park and also has some fine beaches and seafood restaurants, its ancient castle is currently being restored. Heading a little inland from the coast, you will find the small town of Sorbas clinging to the edge of a ravine on the Rio de Aguas, this attractive little town is just perfect as a base for hikers heading into the nearby Natural Park of Karst and Yesos. Sorbas will give visitors a feel for the real Spain, away from the touristy resorts of the coast. A town which formerly rivalled Lisbon in prosperity and influence, Silves on the Algarve, Portugal was known as Xelb by the Moors and was their stronghold in the region, having a huge fortress and a population of around 30,000 by the 12th century. Silves was an important trading town with boats arriving via the River Arade and leaving packed with cargoes of citrus fruit, figs and cork, the town was a buzzing community filled with mosques, bazaars and minarets. This all came to an end in 1189, when the town was subjected to a siege by Sancho I together with a band of English crusaders. After holding out for some months, the Moorish occupants finally surrendered due to a lack of water, the town was subsequently sacked and many of its citizens killed. Silves today is a busy town, still important for citrus fruits, figs and cork, but with an emphasis on tourism, its attractive old town, a maze of narrow, cobbled streets dotted with cafés, restaurants and souvenir shops, its castle and a number of its older buildings, survived the 1755 earthquake. Silves Map. One of the lesser known towns in the Valencia region of Spain, Onda is located just inland from the Costa del Azahar coastline and is approximately seventeen kilometres from Castellon de la Plana. Onda is overlooked by a ruined castle which was built by the Moors during their time in Spain. Onda is well worth a visit if only to take a look at its Natural Sciences Museum, which was founded and filled by a group of Carmelite monks and now has on show many thousands of creatures of all types and from all continents, forming an amazing and interesting exhibition. Also worth a look in Onda is the old town, which still has a medieval feel, and comprises many winding alleys and streets. Map of Onda. Tracing its origins back to the times of the ancient Phoenicians, the city of Portimao is the 2nd largest city in the Algarve region of Portugal (after Faro). A busy commercial port and tourist centre, Portimao is an ideal base for touring the Algarve, beimng within a hour’s drive of Faro International Airport and being close to some excellent sandy beaches including Praia da Rocha, Praia da Vau and Alvor. Perfect for a fishing or golfing holiday, Portimao harbour is the place to book deep-sea fishing trips and boat trips around the port and to neighbouring resorts. Golfing facilities are plentiful with fine courses such as the Alto Golf and Country Club and the Penina Golf Resort situated nearby. The are of course is renowned for its climate and the weather in Portimao is ideal for family holidays as well as being just the job for golfers all year round, with long hours of sunshine and low rainfall. Portimao can be reached from the A-22 motorway and is about 65 kilometres from Faro. Portimao Map. Famous as a playground of the rich and famous, the resort of Marbella located on the Costa del Sol, Andalucia, Spain has a population of over 125,000, which of course increases considerably during the busy summer months, and a municipal area of some 114 square kilometres. Situated in the province of Malaga, Marbella and its neighbour Puerto Banus, has long been a sought after destination for wealthy visitors from Northern Europe. Marbella is also popular with golfers, and there are numerous fine courses in the immediate areas around the resort, other sports which thrive in the town include tennis and all sorts of water sports. Only as long ago as the 1940’s, Marbella was just a small fishing village with less than one thousand residents, it grew when Prince Max Egon zu Hohenlohe-Langenburg bought land in the area and opened the Marbella Club Hotel, attracting a higher class of visitors to this part of Spain. Marbella has some 27 kilometres of coastline and over 20 beaches to explore and enjoy, the climate is fantastic with the weather in Marbella being sunny and dry for most months of the year and very reliable between the months of May and October. Marbella is around fifty kilometres from Malaga and its International Airport. Marbella Map. One of Dorset’s more popular seaside resorts, the town of Swanage has been attracting holidaymakers since Victorian times and became even more popular after the introduction of the railway by the London and South Western Railway Company in 1885. It has survived as a traditional English seaside resort mostly due to its unspoilt nature and the beauty of its surrounding coastline, being part of the Jurassic Coast World Heritage Site of Dorset, which alone attracts thousands of visitors from all over the world. Swanage today has a population of just over 10,000, and its economy revolves mostly around tourism, though it was previously significant for both fishing and quarrying, its being the prime location for many centuries for the production of Purbeck stone and Purbeck marble. As a holiday resort its attractions include its sandy beach, its excellent climate and its beautiful coast, with the renowned Old Harry Rocks located nearby, other attractions include Corfe Castle, Studland Bay, Lulworth Cove, Durlston Country Park, Durlston Bay, Peveril Point and the Swanage Lighthouse, it is a good base for touring many of Dorset’s other attractive towns and villages and beautiful unspoilt countryside. Swanage can be reached by way of the A351 and is about 7 miles from Poole. One of the most distinctive towns in the Valencia region of eastern Spain, Morella is a medieval walled town, overlooked by a 13th century Moorish castle. Its ancient fortified walls are intact and unbroken (save for seven entrance gates), and behind these walls lies a labyrinth of narrow alleyways and streets largely unchanged for centuries. The castle which is now in ruins, dated from the Arab occupation, although the current castle was built upon earlier Iberian and Roman fortifications. Morella has a number of interesting historical monuments and some fine museums. A very old fishing town situated on the Gulf of Roses in Catalonia, Spain, Roses was originally founded as a trading settlement by the Greeks in the 8th century BC. Within the walls of the later 16th century citadel, the Ciutadella, there are still some remnants of this ancient civilisation together with artefacts from the later Roman settlement which began in the 2nd century BC. Roses Spain became a fortified town during the 17th century, a necessary step due to frequent pirate attacks, and these fortifications were truly tested by at least 4 sieges over the ensueing centuries, they were finally destroyed by the French in the early nineteenth century. Roses benefited greatly from the explosion of tourism during the 1960’s and 1970’s and became one of the prime holiday spots along this part of the Costa Brava coast. Roses is still a significant fishing port and has a lively marina with plenty of bars and restaurants where Roses nightlife is enjoyed by its many visitors. Roses, and the Gulf of Roses has plenty of stunning sandy beaches and some fine conditions for water sports, a great attraction for the area. Worth visiting are the Ciutadella, the church of Santa Maria, the Aiguamolls Natural Park, the Cap de Creus and the town of Figueres, birthplace of artist Salvador Dali. This are of Spain enjoys a super climate and Roses weather is ideal for holidays all year round but especially during the summer months when sunshine is the order of the day and rain rare. Roses Map. One of the best known resorts on the holiday island of Majorca, Magaluf is a sun and fun resort that would not suit everyone. Mostly attractive to the younger generation, Magaluf boasts a wide range of entertainment with friendly bars, lively discos and nightclubs and a vibrant atmosphere. The resort does have some excellent sandy beaches which will suit those looking for a more relaxing holiday, and on the beaches visitors can make the most of the wonderful Magaluf weather, which is ideal for holidays during the summer season, and remains pleasant throughout the winter months. The nearby Pirates Show has, since its inception, attracted over 3 million visitors and continues to attract and entertain. Other attractions in Magaluf include water sports, horse riding, golf, aqua parks, go-kart racing and much, much more. Magaluf has an excellent range of hotels and some privately owned rental accommodation, so booking a Magaluf holiday should not be a problem. If you are looking for a non-stop sun and fun holiday, Magaluf might just be the place for you. One of the ever popular coastal resorts of the Orihuela Costa in Spain, Punta Prima is situated between Torrevieja and Playa Flamenca, just off the N-332 coastal road. A renowned area for holidays and relocation Punta Prima has an attractive stretch of coastline and some nice sandy beaches which visitors can enjoy. 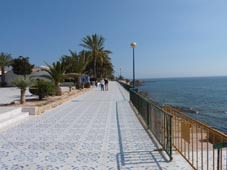 The picture accompanying this post is of the seafront promenade, approaching Punta Prima from the Playa Flamenca end. Punta Prima has a large commercial centre beside the roundabout on the main road and also has a strip of bars and restaurants along the N-332, stretching from the roundabout towards Playa Flamenca. The region benefits from fine weather conditions, being especially sunny and dry from May to September. An ideal spot for golfers there are some six courses within easy driving distance of the resort. Punta Prima is around 45 minutes drive from Alicante airport and 25 minutes from Murcia airport. Punta Prima Map. 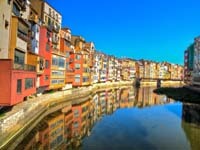 A historic city in the Catalonia region of north-eastern Spain, Girona has a population of just under 100,000 and is the capital of the province of Girona which takes in many of the resorts of the popular Costa Brava coastline. Originally settled by the ancient Iberians, Girona was later called Gerunda by the Romans when they established a citadel there during their occupation of the Iberian Peninsular. Later occupied by the Visigoths and then the Moors, Girona was brought back to Christian control in the 11th century. These days Girona is the arrival point for most visitors to the Costa Brava region being the location of the main airport for the region. The airport is actually located outside the city itself, so to visit the city you will need to take a taxi or bus and from here you can access the coastline north and south via bus or train. Girona enjoys a fine climate with the best weather being during the summer months (May to September), winters are cold with frost not unusual. Worth a visit in Girona are the old town, the coloured houses of the riverside, the ancient cathedral, the Collegiate Church of Sant Feliu and the Benedictine church of Sant Pere de Galligants. Girona is located beside the AP-7 motorway which links it with Barcelona to the south-west, and Figueres and France to the north. Girona Map.